Once again the Northern NSW PS4 National Premier Leagues is blessed with a blockbuster Match of the Round, as Weston Bears welcome Edgeworth Eagles in the Round 9 clash at Rockwell Automation Park. The Bears enter the round on the back of a huge win against Broadmeadow. It was their fifth of the season, and combined with a draw and two losses they are on 16 competition points, in fourth place. Edgeworth finished last weekend in second place, trailing Hamilton by just goal difference. They have the most wins in the competition this season with six and have also lost two, like the Bears, on their way to 18 points. The Bears have a lot to be confident about after their come-from-behind win last weekend. Trailing the Magic 2-0 after 17 minutes the whole team rallied, however Garry McDermott and Jamie Subat have a lot to be proud of after they stood up for the side, each providing an assist for the other, and McDermott then setting up the match winner for Jake Millsteed in the final minute. They will be determined to use this confidence this weekend, as a win will take them to at least third, and potentially see them finish the round in second or even first place. Bears coach Trevor Morris is aware of the threat the Edgeworth Eagles and their young sharp side, but suggested they will ‘have to roll their sleeves up and do it all again’, referring to his side’s Round 8 win. Edgeworth will be a big task for the Bears, as they are looking very sound defensively, and have won five in a row since losing to Hamilton and Broadmeadow in Rounds 2 and 3 respectively. Josh Evans’ successful transition to the backline where he and Pat Wheeler are dominating their opposition is a major factor behind this according to Coach Damien Zane. Zane is extremely positive heading into this match as his confidence in his side grows week by week. ‘Weston away is not an easy place to go, however we are very confident,’ he said. ‘There is a big incentive in this game for us. We are gaining confidence and starting to believe we belong up there at the top of the table’. ‘We are a young side and we will only get better, and we have already proven that we can win in any way, whether it be in a scrappy contest or by playing good football’. Zane said that Justin Tannock and Dylan Holtz will return this weekend after the Round 8 win over the Jets, and they are waiting for clearance for Bren Hammel to return as well. Brody Taylor will miss the match after he was sent off in the last minute last weekend. Just one look at the form of these two sides suggests that this match is going to be a cracker, as combined they have won nine from ten. Both sides play quality football and are defensively very comfortable, however they have both proved that they can find the back of the net comfortably, which creates so much anticipation and expectation for the Round 9 Match of the Round. In the only match to take place on Saturday in Round 9, Adamstown Rosebud host the Newcastle Jets Youth at Adamstown Oval. The Buds enjoyed their second win of the season last weekend defeating South Cardiff 3-0. They moved to nine points, just one and three behind the Jets Youth and Lambton Jaffas respectively, and a win could see them move from seventh to fifth, but would ensure them sixth at the least. The Jets Youth will be determined to bounce back after three losses, where they conceded a total of ten goals, and halted their three game winning streak. They are one point and position ahead of the Buds, in sixth on ten points after three wins and a draw to go with four losses in 2015. There is some extra feeling in this match for Buds coach Graham Law, as he will be coaching against Jets Youth defender Caio De Godoy, who he welcomed into his home several months ago after his move from Sydney. Jets striker Braedyn Crowley also lives with the Law family, however he will remain sidelined through injury this weekend. Law described both as ‘great boys with big futures’, however he will be determined to stop them from getting any points this Saturday. ‘They play with a very high intensity, however that suits our game. They will be ready to go on Saturday. They have some terrific players, and a very good coach in Peter McGuinness who I have a lot of respect for’. The Buds however are in a far better state then they were a month ago in regards to player availability. Roger Dowdell started in last weekend’s win over the Gunners, and they lined up with three first grade players on the bench for the first time this season. Last season these two sides played in two high scoring matches where eleven goals flew into the back of the net. Unfortunately for Adamstown they only scored one, as the Jets ran rampant 5-1 in Round 2 and 5-0 in Round 11. The Jets will be hoping they can produce a repeat of 2014 this weekend, however the Buds will be intent on moving from seventh, the highest they have been on the ladder in 2015. Maitland welcome Hamilton to Cook Square Park on Sunday afternoon, determined to claim their first huge scalp in their first season back in the top flight after a twelve year absence. It would be just the momentum the Magpies need after a poor start, sitting in ninth position after a win, a draw, and six losses. They are on four points, just one ahead of the last placed Charlestown. Hamilton finished Round 8 in first position on 18 points from a possible24. They have won five matches and drawn three this season, and have the best defensive record, being the only side to have not conceded double figures, as they have only had to pick the ball out of the net nine times. After a 2-1 loss against the Jaffas last weekend, Maitland coach Reece Thompson suggested that he could not fault the effort of his players, putting his hand up to take responsibility for the slow start to the season. One thing that both Thompson and the Magpies will not do in any match, or point of this season, is give up. They will be a handful for every team they come up against this year, including the league leaders Hamilton this weekend. The Jets Youth finished first in 2014 with a total of 34 points. Maitland are currently on four and have ten games left. Mathematically they can achieve the Jets’ 2014 total. Whilst unlikely, this illustrates that the season is nowhere near over, and that with a bit of courage and determination any of the struggling sides, including Maitland, can stand up and make a push for the finals, or at least away from the drop zone. At the other end of the spectrum Hamilton remain the only undefeated team in the competition after Magic lost to Weston last weekend, and if they can maintain that record after this weekend which marks the halfway point of the season, then they will have set themselves up perfectly for a push not only to the finals, but for a crack at first place. This match should be a great battle in all areas of the pitch, as both sides possess quality players all over the park. Charlestown City Blues host Broadmeadow Magic on Sunday afternoon in a match where both sides are looking to bounce back from Round 8 losses. The Blues have lost seven of their eight games this year, one of which was last weekend, 4-2 away to Hamilton Olympic. Their sole win over Adamstown in Round 2 sees them sitting last on three points. Broadmeadow forfeited top spot after their loss to Weston last weekend. They dropped to third, on 17 points, after five wins, two draws and a maiden loss. Magic coach Robert Virgili will be looking for a more complete performance for the full 90 minutes this weekend, after throwing away a half time lead last weekend against Weston at home, surrendering first in the process. ‘In the second half we got what we deserved,’ he said. ‘We allowed too many stupid fouls, and gave them momentum through free kicks and corners. They put us under pressure defensively and we didn’t handle it’. He does not believe the loss is a season changing moment however, and challenged his players to bounce back from it positively. If Magic happens to win this weekend they will have equaled their 2014 tallies of six wins and 20 points after just half a season, a clear sign they have improved immensely in 2015. Last season the side in red scored 24, whereas this year they have two more than that before the halfway mark, suggesting that developments in the front third are a large factor behind the side’s improvement. Speaking of 2014, these two sides shared mixed head to head results in their two matches. In Round 7 at Magic Park Broadmeadow triumphed 3-0, but then in Round 18 the Blues were victorious 2-0. This match features a side who have lost just once, taking on a side who have won just once. Charlestown will be no pushovers this weekend however, and the fixture will be hotly contested for the full 90 minutes. 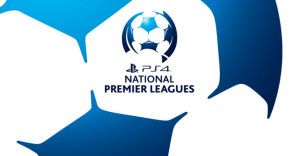 The final match of Round 9 of the Northern NSW PS4 National Premier Leagues sees 2014 Grand Final Winners Lambton travel to Ulinga Oval to take on South Cardiff Gunners. The Gunners have endured a slow start to their 2015 campaign, winning just one game from their opening eight. Combined with two draws and five losses they sit in eighth place on just five points. Lambton Jaffas scored their third win of the season last weekend. Alongside three draws and two losses they sit one place outside the top four on twelve points. The defending Grand Final Winners’ coach Dave Tanchevski has been frustrated at times this season, as his side consistently perform, yet struggle to put away their chances. ‘We have gone ahead in every game except Round 1, but we are fifth and only have twelve points which is disappointing,’ he said. ‘We have to be on our game this weekend as South Cardiff up there (at Ulinga Oval) is always a tough game’. ‘We will be missing Jamie Byrnes this weekend, but will welcome back Michael Bridges from Hong Kong, and we will nearly be at full strength’. South Cardiff coach Greg Asquith is keen to bounce back from another loss last weekend, and believes his side can improve in a very good competition. ‘The competition is very tight this year. All teams are big challenges and there are no easy games, but I feel confident going into the match against the Jaffas,’ he said. Asquith also said that Sean Clerke will be back for the Round 9 match, however Dean Kelley is still a few weeks away from returning and there are fears Lee Ashton’s injury could see him sidelined for the season. Mitch Wallace will also be out. In 2014 both of these sides took three points from the other at their opponents’ home ground. Jaffas won 3-2 in the pouring rain at Ulinga Oval in Round 9, then South Cardiff won 2-1 at Arthur Edden Oval in Round 16. This is a trend the Gunners will be hoping to end this week as they look to build some momentum to push themselves up the table, however the Jaffas will be intent on inflicting as much pain as possible on a side struggling for numbers, and for form.